1. 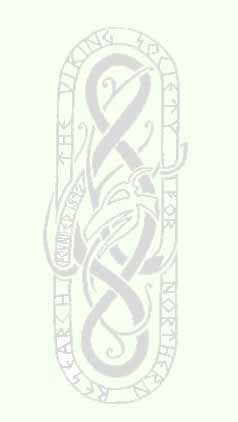 The Society shall be called the VIKING SOCIETY FOR NORTHERN RESEARCH (founded in 1892 as The Orkney, Shetland, and Northern Society or Viking Club). 2. The Society is founded as an Antiquarian, Literary and Social Society. (a) By holding Meetings for the consideration and discussion of papers upon subjects connected with Northern history, literature, music, art, archaeology, language, folklore, anthropology, and other matters. (b) By publishing the Saga-Book, which may include papers read to the Society, as well as articles, reviews and other matter of interest to Members, approved by the Editors. (c) By publishing and encouraging the publication of early Northern texts, translations and books relating to Northern history, literature and antiquities. (d) By supporting the Society's Library, which is maintained as set out in Law No. 48. (e) By corresponding with other Societies and exchanging publications. (f) By holding Social Gatherings, Concerts, Reunions, and such kindred entertainments as may be decided upon. (g) By such other methods as the Council may determine from time to time. 4. The Society shall consist of one class of Subscribing Members and two classes of Non-subscribing Members, namely Honorary Life Members, whose number shall not exceed twelve, and Honorary Members. Honorary Life Members and Honorary Members shall be elected by the Council. Honorary Members shall remain such during the pleasure of the Council. The Council may admit institutions as Members, but these shall have no voting rights nor receive notice of meetings or accounts. 5. Any persons interested in the North, or its literature and antiquities, shall be eligible as Members. Applicants shall be admitted to or be refused membership by the Council or by an officer appointed by the Council for this purpose. Any refusal by an officer shall be reported to the Council at its next meeting and may then be rescinded by the Council. 6. Honorary Life Members shall be persons who in the Council's opinion have attained eminent distinction in Northern Studies. They shall receive gratis the Saga-Book and all publications delivered free to members and such other publications as the Council may decide. 7. Honorary Members shall be persons who may appear to the Council to have rendered or to be able to render valuable assistance in promoting the Objects of the Society. They shall receive gratis the Saga-Book and all publications delivered free to members and such other publications as the Council may decide. 8. Every Member, upon admission to the Society, shall receive a copy of the Law-Book. 9. Subscribing Members shall pay to the Honorary Treasurer yearly on October 1st, in advance, the subscription as decided by the Council. In return, they shall receive gratis the Saga-Book and such other publications as the Council shall determine. The Council shall have the power to admit Members at a reduced subscription rate. 10. Any Subscribing Member wishing to withdraw from the Society must give written notice of the same to the Honorary Secretary at least two weeks before the Subscription for the ensuing year becomes due, or, in default, such Subscribing Member shall remain liable for such Subscription. 11. Any Subscribing Member one year in arrear with Subscription shall cease to belong to the Society, but shall be responsible for arrears of Subscription due. The Council shall have power to reinstate such a Member if they see fit, on payment of arrears. The Council shall have the power at any time to terminate the membership of any Member. No more than twelve, nor fewer than seven, Councillors. 13. The President, the Vice-Presidents and the ex officio members of Council shall be chosen from Subscribing or Non-subscribing Members; the Councillors shall be chosen from Subscribing Members. 14. The President shall normally serve for a term of two years, subject to re-election at the end of the first year. After retirement he or she shall not again be eligible for election as President until two further years have elapsed. Vice-Presidents are elected by the Council and are eligible for re-election each year. 15. Councillors shall normally be twelve in number and shall normally serve for a term of three years. The four longest-serving Councillors shall retire yearly, and the remainder shall be eligible for re-election. After retirement they shall not again be eligible for election as Councillors until one further year has elapsed. Nominations shall be made by the Council, and forwarded by the Honorary Secretary, along with the Summons to attend the Annual General Meeting, to every Member within the United Kingdom and Ireland at least four weeks before the Annual General Meeting. Should any Member wish to submit nominations in addition to those made by the Council, such nominations must be forwarded to the Honorary Secretary at least two weeks before the Annual General Meeting, along with the names of the proposer and seconder. Notice of such nominations shall be sent to Members one week before the Annual General Meeting. Voting shall be by ballot of those present at the Annual General Meeting. 17. Any vacancies arising in the Council in the course of a Session (that is, between Annual General Meetings) may be filled by the Council, subject to ratification at the next Meeting of the Society. 18. The Council shall appoint and may remove the Honorary Secretaries, Honorary Assistant Secretary, Honorary Treasurer and Editors, and these officers shall be responsible to the Council. They shall receive no stipend, but the Society may reimburse their expenses at the discretion of the Council. 19. The Council shall meet at such dates as they shall determine. Five members of the Council shall form a quorum. The Chair shall be taken by the President, or, in his or her absence, by a Chairman elected for the occasion. The Chariman shall have only a casting vote. 20. A Special Council may be held by order of the President, with the concurrence of one of the Honorary Secretaries, or by a requisition of five members of the Council, stating the purpose thereof, addressed to the President, who shall instruct the Honorary Secretary to call a Meeting of Council to be held within four weeks after such requisition has been made. 21. Decisions of the Council shall be by a vote of the majority present and voting, but otherwise the Council may regulate their own proceedings by Standing Order or otherwise, as they may see fit. 22. The Council shall have the sole management of the assets and income of the Society, and also the entire management and superintendence of all other affairs and concerns thereof. 23. The Council may make By-Laws (not inconsistent with these Laws) for carrying into effect the Laws, and for the general management of the affairs of the Society. Such By-Laws shall, after notice given, be reported to a Meeting of the Society for confirmation by Resolution of the Society, and they shall be subject to repeal or alteration only at a Special or Annual General Meeting. 24. The Council shall present to the Annual General Meeting an audited account of the funds for the financial year to 30th September or such other date as the Council shall determine, which shall not be more than eighteen months after the end of the last financial year. 25. Two Members shall be elected as Trustees by the Annual General Meeting, and shall hold office thereafter during the pleasure of the Council. Vacancies arising in the course of a Session shall be filled by the Council, subject to ratification by the next Annual or Special General Meeting. 26. One Member, not being a Member of Council, shall be elected as Honorary Auditor for the ensuing year, at each Annual General Meeting. A vacancy arising in the course of a Session shall be filled by the Council. 27. The Council may appoint an Honorary Solicitor, who shall continue to act during their pleasure. 28. The Council shall appoint as Honorary Librarian of the Society the Librarian of University College London. The Honorary Librarian shall during his or her term of office be an Honorary Member of the Society. 29. General Meetings of the Society shall be held at any place decided by the Council at such times as the Council may determine. 30. The Programme of each Session shall be arranged by the Council. 31. At all Meetings the Chair shall be taken by the President or, in his or her absence, by the senior Vice-President present. In the absence of any Vice-President, those present shall elect as Chairman for the occasion one of the twelve Councillors. In the absence of any Councillor, those present shall elect as Chairman for the occasion one of the Subscribing or Non-Subscribing Members present. 32. Seven shall form a quorum at all Meetings. The Chairman shall have only a casting vote. 33. At Meetings all Members shall be entitled to be present, to take part in all discussions, and to vote, with the exception of those disqualified by Laws Nos 4 and 34. 34. Subscribing Members who are in arrear, or who have not paid their subscriptions for the current year, shall not be entitled to vote at any Meeting of the Society. 35. The Council may allow Proxy at any Meeting of the Society or Council, but only upon such special resolutions as they shall determine. Notice of such Proxy and special resolutions must be given in the Summons calling the Meeting. Members of the Society or Council, as the case may be, must give written notice to the Honorary Secretary of any proposed amendments, and the Honorary Secretary shall send notice to all Members of the Society or Council of such proposed amendments, at least five days before the Meeting. 36. The Annual General Meeting, of which at least four weeks' notice must be given by one of the Honorary Secretaries to all Members within the United Kingdom and Ireland, shall be held yearly to receive the audited accounts of the Society, to hold elections, and to consider and, if approved, to pass any resolution of which notice has been given in the Summons calling the Meeting. The date of the Annual General Meeting shall be determined by the Council and shall be not more than ten months after the end of the financial year. 37. A Special General Meeting may be called at any time by the Council, or by a requisition addressed to the Council, signed by ten Members, stating the object thereof. In the latter case, the Council shall instruct the Honorary Secretary to call a Special General Meeting (to be held within two calendar months after the delivery of such requisition), of which at least one week's notice must be given, stating the exact nature of the business to be transacted. 38. Members may introduce guests to all Meetings of the Society, subject to such By-Laws as may be made by the Council from time to time. 39. The Saga-Book shall normally be published as an annual number. 40. Other works may be published by the Society, subject to the approval of the Council. 41. All scholarly communications to the Society shall be the property of the Society and placed in the charge of the Honorary Librarian. 42. No matter shall be printed or illustration borrowed from any publication of the Society, or from any of the Society's material held by the Honorary Librarian, without the sanction of the Council. 43. The Society may exchange its publications for those of such other Societies as the Council may from time to time determine. All exchanges shall be forwarded to the Honorary Librarian. 44. The Council may form Funds for Special Purposes. 45. Such Funds for Special Purposes as the Council may wish to invest must be invested, in the names of the Trustees, in securities authorised for investment by the Trustees. 46.The uninvested incomes and funds of the Society shall be held in such Bank or Building Society accounts as the Council shall determine, and shall be operated by such member of the Council and upon such terms as the Council shall authorise for this purpose. All the remaining property of the Society shall be vested in the Trustees, and disposed of as directed by the Council. 47. The stock of unsold publications, blocks, plates for illustrations, and all other property of the Society not otherwise provided for, shall be safely kept under the charge of the Honorary Secretaries. 48. By virtue of an agreement dated October 10th, 1931, between the Society and University College London, all books, plans, drawings, engravings, photographs and objects of antiquity which belong to or shall be received by the Society, shall be presented to University College London, and any member of the Society may have access to the Scandinavian collections of the College, including all books, plans, drawings, engravings, photographs and objects of antiquity thus handed over, and be allowed to borrow books from those collections without deposit under the usual Library regulations. 49. In all proceedings by or against the Society, the Society shall sue and be sued in the name of those serving as Honorary Secretaries at the time, who shall be indemnified against all liabilites arising out of such proceedings out of the funds and assets of the Society. 50. The adoption of any new Law, or the alteration, suspension, or repeal of any existing Law, can be proposed only by the Council or by ten Members, at any Special or Annual General Meeting, in accordance with Laws Nos 36 and 37. 51. The Society may be dissolved by the Members in Special General Meeting by a resolution proposed by the Council, in favour of which at least three-quarters of the Members voting in person or by proxy have voted. Proxy voting shall be permitted and proxy forms shall accompany the notice of such meeting. Following dissolution the Council and officers shall remain in office to effect the disposal of the Council's assets, but no further members of Council or officers shall be appointed or co-opted, and those remaining may act, whatever their number shall be, notwithstanding the number otherwise required by Law No 12. The Members shall have no further rights other than rights (if any) to share in the assets of the Society. After dissolution, the Council shall first discharge the liabilites of the Society out of its assets and shall then hold the balance to be distributed amongst Members and/or charitable educational institutions in accordance with a scheme of distribution, of which copies shall be sent to Members with the notice of the meeting. Such scheme shall specify the Members and institutions to be benefited thereby and the amount or basis of calculation of the amount of such benefit or the assets to be transferred. 52. All, Laws, By-Laws, and Resolutions made previous to the foregoing Laws are hereby repealed.